Omega communities are designed to meet our residents’ every need, and our community dining offerings go above and beyond that. Here, residents enjoy delicious foods prepared just for them! We realize how much a tasty, nutritious meal taken in among the company of friends and neighbors can lift up a person’s day. Each of our culinary team members is always excited to offer satisfying, healthy meals in a friendly, home-like environment where residents dine together as friends and family. Rest assured our onsite chefs offer all-day dining options, which include seasonal meals and accommodations of special diets, so there’s always a healthy and delicious option for every taste. We strive to create inviting mealtimes, because we understand that a great meal shared with those who care about you is one of life’s simplest, yet most impactful, pleasures. This is why our restaurant-style dining rooms are always beautifully appointed with inviting scenery, comfortable seating, and a friendly atmosphere. 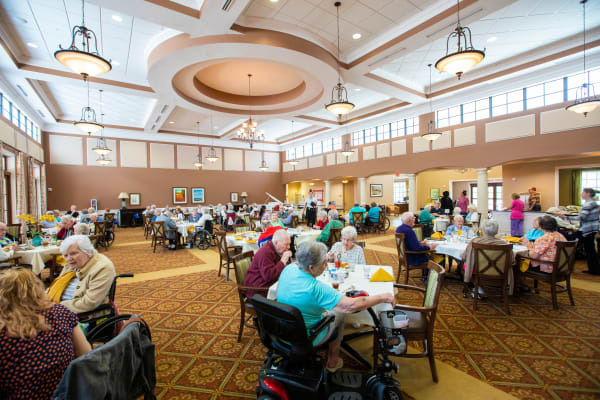 The design of our restaurant-style dining rooms allows residents individual choice at mealtime, while ensuring they’ll enjoy every meal in the company of others. To learn more about the meal plan at an Omega community near you, contact us today!